Do you think a good athlete is smart? He or she is. Abilities that are not developed in a regular elementary or middle school classroom can be understood and appreciated as kinds of intelligence. Learn about sports smart as one category of the larger concept of body smart. Did you know that preschool children ask their parents about 100 questions a day, but by middle school the act of questioning has almost disappeared in most children? I hope this is not the case for you. But that means you are doing something right. Color Me Purple demonstrates the importance of open-ended questioning as one tool to encourage your child’s ongoing curiosity. Intelligence means a high I.Q. on a specialized test, right! In fact, in 1983 Dr. Howard Gardner of Harvard University published a book entitled Frames of Mind: The Theory of Multiple Intelligences. Eight characters in Color Me Purple represent 8 different kinds of intelligence according to Gardner’s theory. You can read about multiple intelligences on this blog, or better yet, share them with your children as you read Color Me Purple together. Do smart children always have large vocabularies? Reading, writing, and speaking are all part of what Gardner calls linguistic intelligence. This kind of intelligence is measured on I.Q. tests and is often the basis for identification of gifted children in schools. However, being word smart is not synonymous with smart. It is important to remember it is just one of many kinds of smart. If my child really loves an area of study, won’t he naturally grow up to be good at it? I’ve heard preteens and teens say things like, “When I grow up I’m going to be a star basketball player!” They love a certain thing and think their natural ability along with a little luck will make their dreams of becoming great at it come true. In reality, no matter how much ability or passion one has, accomplishment comes with learning, making mistakes, and learning more through practice. The challenge for parents and teachers is to balance the extrinsic motivations they offer their children with the intrinsic motivations of the children themselves. If my child loves to sing and has rhythm, is she musically intelligent? There are two characteristics of music-smart children, but music-smart children often get little recognition in American elementary schools. You may need to provide home support to ensure her passion is encouraged over time. Music-smart children may hit a wall at some point during required practice. Your challenge will be guide her through such challenges so she can continue to develop her music-smart abilities. Should I get a tutor to help my child develop his or her talent? Often talented children need more attention and expertise than a regular classroom teacher or even a specialized teacher can offer. I recommend finding a trustworthy adult in your communicate who might serve as a mentor. Mentors act as role models and guides-on-the-side as well as experts in their fields. Children often report being inspired by mentors in new and different ways. Why do you add the words “and more” to this kind of smart? Being art smart is just one way of describing a children who not only excel at art projects, but also children who think in patterns, and learn by seeing rather than hearing. We call these children visual-spatial learners. If we include all visual-spatial learners in our definitions of smart, we exponentially will expand the number of children being recognized and guided for having some kind of talent. Augustus and His Smile —Written and illustrated by Catherine Rayner, 2006. With fabulous illustrations accompanying her text, Raynor tells the story of Augustus the tiger searching high and low for his lost smile. Who could guess where he finds it? I’m certainly not letting the cat out of the bag—so to speak. Beautiful! Joyful! A great read-aloud book. Utterly Lovely One—Written and illustrated by Mary Murphy, 2012. If ever there was a book to read cuddled up with a child, this is it. The croon-able text and swoopy illustrations are a great match. Mama Crane says to her chick “oh, my yummy one, my utterly lovely one!” The jungle creatures are extravagantly admired. It’s so nice to witness compliments being strewn about. This book is so…inclusive—and a great excuse to hug your chick. An Awesome Book—Written and illustrated by Dallas Clayton, 2008. This book starts, “There are places in this world where people do not dream…of rocket-powered unicorns.” The incredible illustrations are a huge part of the book. Encouraging and glorious words, images and dreams spill over from page to page. “Please dream for those who’ve given up and those who’ve never tried; please use your dreams to make new dreams for all the dreams that died.” A great book for all ages—the older you are the more you can appreciate the words, the message, and even the detail in the illustrations. This is a book perfect for the person you know who is going off on an adventure or has had a dream dashed and needs a bit of encouragement to dust off and try another. It’s good to be reminded—those rocket-powered unicorns are out there somewhere. There Are Those—Written by Nathan Levy and Janet Pica; illustrated by Joan Edward, 2002. “But there are those (And they are few) Who see much more Than others do. This small book has a delicate message. These written words evoke all sorts of feelings and the splashes of abstract art free the mind to fill in with the imagination. Affirming and encouraging, I think. I am really attracted to this book. Free-form illustrations perfectly complement the rhyming text. Short and sweet. Re-reading is irresistible! The Empty Pot—Written and illustrated by Demi, 1990. Rarely is a book written for children that honors honesty so gently and clearly as this one does and not come off as preachy. Ping, a young boy in long ago China, loved growing things and was known far and wide for his green thumb. Everyone in the kingdom loved flowers—even the old Emperor! The old Emperor’s dilemma was this—how to choose a worthy successor. Deciding to “let the flowers choose,” he let it be known the child who could grow his royal flower seed the most successfully should be the new Emperor! Ping and thousands of other children took up the challenge. Wait just a minute—despite all his love and attention, Ping’s seed did not thrive. How Ping became the Emperor’s successor is a marvelous lesson in honesty and the value of telling the truth. The sweetly delicate illustrations are just perfect. Piggy Bunny by Rachel Vail. Illustrated by Jeremy Tankard. Liam was a “perfect piglet”—his dad said so. His mom pronounced him “terrific”—so what could be wrong? What was wrong was that Liam the piglet wanted to be an Easter Bunny. He practiced hopping, eating salad and delivering eggs. His parents couldn’t understand his desire to be different — but Liam was lucky. He had grandparents who understood about dreams. Using thoroughly modern means, Liam’s grandparents helped him with that magical transformation —— showing the world what he was feeling inside. I can’t help but think this is the perfect gift for people (as well as pigs) of all ages whose inner and outer looks don’t match at first—but with a little love, a little help and a little luck end up happy in their own skin. Boy and Bot by Ame Dyckman. Illustrated by Dan Yaccarino. The first sentence of this book caught me up and promised it would be special—and did it ever deliver. “A boy was collecting pinecones in his wagon when he met a robot.” Finding a friend is one of the greatest joys of life. This warm and wonderful story shows these two friends taking care of each other as best they can, as friends do. Will you want to rush out and read this book to someone? Affirmative. 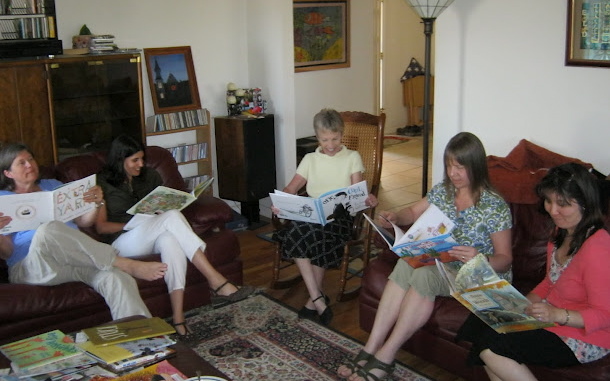 Jocelyn, Rosa, Ellie, Anne, & Tricia reading children’s books together. Extra Yarn by Mac Barnett. Illustrated by Jon Klassen. I am happy to say here is another fantastic author/illustrator duo. “Annabelle found a box filled with yarn of every color.” She knit and knit, and knit and knit—and there was still extra yarn. Even after knitting sweaters for all, including animals, birdhouses and at least one mailbox, there was still extra yarn in the box. Annabelle knew what was important to her—and it wasn’t the evil archduke’s million dollars. A great story in itself—and a great conversation starter, if you feel like talking about what is important to you. Boy Wonders written and illustrated by Calef Brown. “May I ask you something? Are you ever perplexed? Completely vexed? Do you have questions? Queries? Odd theories? You do? ME TOO!” That is how this romp of a book starts—and it keeps going and going and going so you feel like gravity is taking over somehow and making it fun to read faster and faster —even with tongue twisters thrown in hither and yon. Laughter abounds! A treat! A delight! The perfect gift for—you guessed it—someone you know who has endless questions. I loved it. One Cool Friend by Toni Buzzeo. Illustrations by David Small. A priceless pairing of text and illustrations, One Cool Friend is a gloriously silly story combining proper manners with what people say and what people don’t say and what we assume in our everyday conversations. It all starts with Elliot’s father suggesting an outing to the aquarium for Family Fun Day. (I love the illustration here of Elliot, dressed in a tuxedo, interrupted while obviously reading to a huge crowd of attentive stuffed animals, but still answering his father courteously). With one thing and another, all of a sudden at the end of the book it is the reader who is surprised, not so much Elliot or his father. A clever and heartwarming book, really—you must read it. Soon! 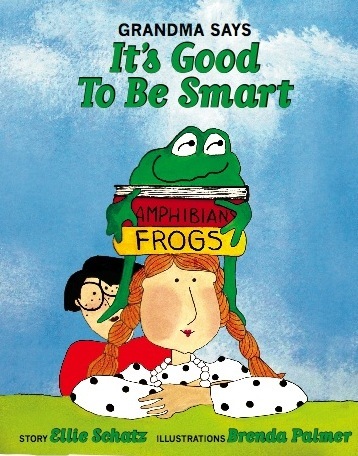 Grandma Says it’s Good To Be Smart by Ellie Schatz. This story is written from a grandchild’s point of view, stating truths such as, “it’s good to ask questions” and “it’s good to use your imagination.” I love to watch the children as I read this book. I can see the effect of the words and ideas on their faces. How wonderful to have your curiosity and fanciful thinking affirmed, validated and even encouraged! Wow! Heady stuff! Great for all ages − it’s never too early to learn that you’re smart! Written for her own grandchildren, Schatz writes a book for grandchildren everywhere, while the clear, whimsical pictures illustrate the text perfectly. Very satisfying. I can’t wait ‘til her next book gets published. Naamah and the Ark Night by Susan Bartoletti. Not overtly religious, this book is relaxing and soothing. Singing to animals and humans brings comfort and peace, both in this book and in real life. I can’t rave enough about this gentle book. The illustrations mesh perfectly with the text. It’s a keeper. Worth seeking out. Press Here by Herve Tullet. You may have heard about this book since it’s been on the NYT best seller list for weeks. I am happy to say all the kudos and more are well deserved. Tullet has created a magical book that reinvents the idea of a book for all ages. I have read it to 18 month-old children, 4 year-olds, parents, and grandparents. Captivated from the first page, this hands-on book brings a smile and chuckles to all. Adults are just as eager to follow the instructions, such as “press here,” eagerly turning the page to see the “result.” It’s hard to resist once you have experienced this book. Give in to your inner child and treat yourself to this experience. Try Press Here, you’ll be caught! Black and White by David Macaulay. This is an older book but a treasure nonetheless. For slightly older kids − say from 4 or 5 on up. The older the child the more can be observed, figured out, combined, enjoyed, and appreciated. At first glance, Macaulay presents us with 4 stories − wow, 4 stories in one book! But, wait − as we turn the pages and try to catch all the story lines, a funny thing happens. They seem to mesh and meld and swirl into one in front of our very eyes. The younger children will get a kick out of the individual stories, while the older children (and adults) will enjoy the creation made by the combination. As children grow older, they can read it again and again, gaining a richer understanding of what has been in front of their eyes all along. When reading with a child or two, allow lots of time for discovery and discussion! An amazing author; an amazing book. Cassandra’s Angel by Gina Otto. A book to hold close and share liberally. A book to read over and over to spread the word that you are NOT just what other people say you are. In this story young Cassandra tries to follow the rules, but gets swept up in her dreams and imagination, resulting in imperfect actions. The adults in her life criticize her harshly. Cassandra is hurt and confused by what they say − but after considering their words consciously rejects the negative labels. Her inner angel speaks to her, saying, “You are never just what they believe you to be.” Cassandra concludes, “I’m Cassandra, a bright light!” This is a book to brighten the spirit. Say What? by Angela DiTerlizzi. A silly book for everyone: “When a snake says HISS does she really mean KISS?” Great rhymes and fun illustrations make this book hugely popular at Story Time. A loving ending that inspires hugs. A Little Bit of Love by Cynthia Platt. Small Mouse craves something to nibble, but what? Mama Mouse and Small Mouse go all over collecting ingredients for the perfect snack − and of course the secret ingredient is love. A warm, loving book that satisfies your sweet tooth. Smelly Bill by Daniel Postgate. For anyone you know who is reluctant to jump into the tub. A great rhyming story of Bill the dog − have I mentioned Bill is an extremely FRAGRANT dog? Well, his family leaves him in the capable hands of Aunt Bleach − but the results are not quite what you − or Aunt Bleach − expected. Very fun − great free-flowing illustrations; sure to make you laugh, even if − or especially if, I guess − you are a cat person. We Need A Horse by Sheila Heti. Most appreciated by the older child; perfect for someone asking big questions. This book begins with a horse asking the light, “What is the reason I was made a horse and not some other animal?” Of course sometimes answers need to be discussed before they make sense, and Horse has conversations − with Sheep, and even Apple. I found this book stuck in my mind. It might raise as many questions as it answers, but that can be a good thing. I thought the illustrations perfectly matched the text. A 20 year old I know liked it. Thoughtful and unusual. Big Little Brother by Kevin Kling. Kling teams up with Chris Monroe (of fabulous Monkey With A Tool Belt fame) to create a treasure of a book. Told from the perspective of an older brother, the story and illustrations just can’t be beat. I urge everyone − even those with no brothers at all − to read this book… preferably with a child, but not a requirement. Chilly Milly Moo by Fiona Ross. Oh no! Milly the cow isn’t giving any milk! The farmer is not happy! But wait − it’s getting colder out −brrrrrr. What happens next will make you smile − 100% guaranteed. King Jack and the Dragon by Peter Bentley. A wonderful story of bravery, imagination, summer days and friendship, with a comfortable snugly ending. I think of Nancy, a friend of mine, her brave family and her strong grandson Jack every time I read this. There are all kinds of bravery and strength in this world. Interrupting Chicken by David Stein. Most will be able to identify with the patient father who is happy to read to an impatient child. Loving reminders about not interrupting aren’t wasted on the audience. Kids from age 2 on up really seem to get how funny it is. Very fun read aloud, whether it’s to one child or a group of 25. Stars by Mary Ray. What a glorious book. The words and illustrations combine into one of the most low-key but dazzling books of the season. Compelling for adults as much as kids. It’s fun to think about putting a star in your pocket for when you need it. ; or on your shirt to be a sheriff. Great conversation starter. I fell in love with this book. Higher! Higher! by Leslie Patricelli. C’mon, Dad! Higher in the swing. Higher! Higher than Dad, higher than the trees − oh my − higher than − really? We get swept away in this girl’s imagination and bold illustrations. By the end of the story everyone is calling out, “Again! Again!” Short but sweet; a great read! Stuck by Oliver Jeffers. Floyd’s red kite gets stuck in a tree. How he resolves this problem has listeners laughing whether they want to or not. I LOVE this book! Just too funny; rush out and read it with someone! Bark, George by Jules Feiffer. This isn’t a new book but I still love it − George the dog can’t seem to bark − he can quack and oink − even moo − but a trip to the vet solves the mystery in a hilarious way − almost! 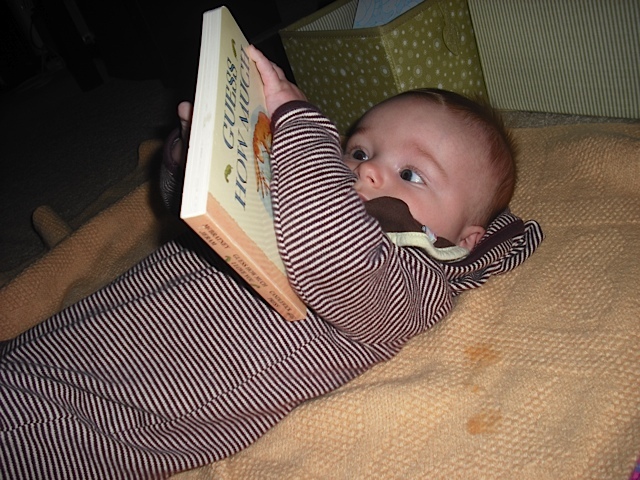 It’s never too early to start exploring the world of reading. And Here’s To You by David Elliot. A celebration of a book. Why not celebrate the fishiness of a fish? They and many other things are celebrated as a part of our big beautiful world. 999 Tadpoles by Ken Kimura. What are parents to do when their 999 tadpoles overcrowd the little pond they call home? The illustrations and fanciful story match perfectly and − just as I was hoping − there is a happy ending after a wild ride of an unplanned adventure. The Artist Who Painted a Blue Horse by Eric Carle. A young artist fills Carle’s newest book with lush, gorgeous improbably colored animals − just like many famous adult artists, it turns out. Joyful! A Dog Is A Dog by Stephen Shaskan −A delight of a book. When read at Story Time everyone was laughing. Big colorful illustrations accompany the simple and silly text. A big or small crowd pleaser. How To Be A Good Cat by Gail Page −A conscientious (dog) babysitter wants to teach his (kitten) charge some life lessons. Very fun! With great illustrations, this book describes some differences between cats and dogs − and one important similarity! Noodle And Lou by Liz Scanlon −When you are feeling down it’s easy to think of all your faults. How heartwarming to be cheered up by your best friend who turns each fault into a strength. A great book to have on hand when all you see is lemons. The Belly Book by Fran Manushkin − Only people with bellies loved this book. Nice, multicultural illustrations keep everyone giggling. Great rhyming text goes along with them. Where else are you going to see an alien in a bikini, anyway? Dear Zoo by Rod Campbell − I can’t help myself − I find myself reading this classic for Story Time 2 or 3 times every year. Even though some kids have it memorized, everyone loves to shout out who is hiding behind the flaps. The wise zoo personnel finally get it right − every time. It’s no secret, I am a sucker for happy endings. Cows To The Rescue! by John Himmelman − so wonderful − it makes you wonder how we all get through the day without cow support − a riot. I love it. The I Love You Book. It’s OK To Be Different. The Peace Book. − and every other Todd Parr title. Parr has such great illustrations − bright green, blue, red, yellow people and animals −- everyone feels included, for one thing. The other thing is he writes gentle, loving books that hold children’s attention while imparting the great message of ‘let’s all get along.’ In one of his books he suggests putting your underwear in the freezer to help you cool off − how could you not love these books? I’m Not Cute. I’m Not Scared. I’m Not Ready. —Books by Jonathan Allen. His main character, a young owl, finds himself in typical toddler situations − and couldn’t be sweeter. His mother is encouraging and supportive. 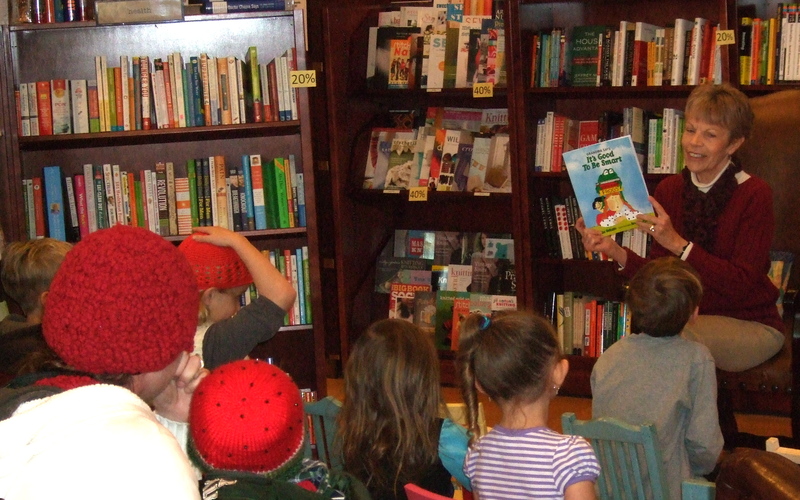 Kids love the books and so do adults — great illustrations and they are fun to read. You Are Friendly. You Are Helpful. You Are Beautiful. You Are Healthy. You Are Brave and maybe even more books by Todd Snow. I am not quite sure what rivets children’s attention to these small books, but it happens. The books are written simply, with great multicultural illustrations, and kids can identify with the themes. 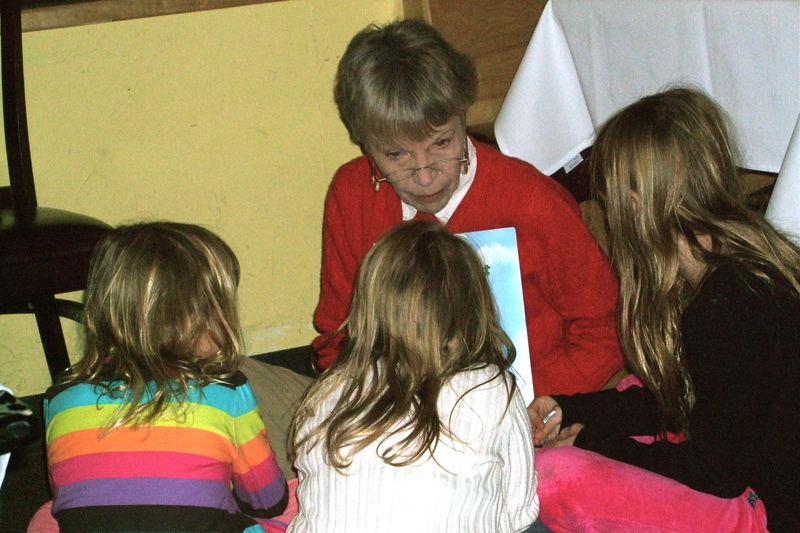 I read You Are Friendly and You Are Helpful during Story Time one day, and many young kids volunteered examples of when THEY were friendly or helpful. It triggered great interaction. Rabbit Pie by Penny Ives. This book lovingly describes the perfect ‘recipe’ for getting little bunnies ready for bed. The perfect bedtime or anytime book. Quite wonderful. What Animals Really Like by Fiona Robinson. What a treat and treasure of a new book this is! Adults laugh out loud, along with the kids, and both groups have fun inspecting the detailed illustrations. I just love it! Construction Crew by Lynn Meltzer. A happy book with terrific rhyming and bold, colorful illustrations − really irresistible. If You’re Hoppy by April Sayre. A great takeoff on the song, “If You’re Happy And You Know It.” Kids recognize the tune, it’s a fun book to read, and it’s not my fault if everyone is humming along by the end of the book − a story time favorite. Hiccupotamus by Aaron Zenz. Priceless − Written with such a sense of fun and enthusiasm − wonderful illustrations − just talking about the book makes me smile. This is another I’d call irresistible. Happy Hippo Angry Duck by Sandra Boynton. Boynton is one of my all-time heroes, but this even stands out from her wildly popular body of work. What impressed me so much is not that the focus of the book is the listener − that is common enough. What is so cool is it is asking how the listener – presumably a child − is feeling, validating that feeling or mood, and then reassuring that a bad mood can change. Things − moods, life − can get better. This is such a great book for kids to start putting names to their emotions. The book is short, like most of Boynton’s, but not one to be rushed through. What a great way to get a conversation going in anyone − child, adult, or in between.